Ensuited cabins $80 D bed made. Heading north we are 1 km from the town (Murray St, Newell Hwy ) just before the Mulwala Canal, (so if you go over that you have gone too far). First you have the bowling club then the lake and we are behind the swimming pool. You will see our sign. When heading south we are on the right hand side just over The Mulwala Canal. Our park behind the council swimming pool has direct access to the lake for Fishing, boating and Kayaking . 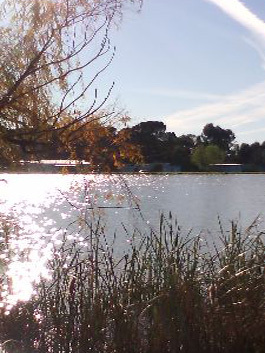 You can walk or ride around the lake it takes about half hour (if you walk of course) It is 500 meters to the bowling club now doing meals and within easy walking distance (10 minutes) to the town centre. There is a great pub , Bowls club , Golf club and the RSC which runs a courtesy bus. For group bookings you get FREE muffins. We have a games room (pool table, music, darts, boules and games) for your enjoyment and a FIRE PIT area for winter (4.30 p/m). Sites $25 Double. Weekly discounts and 3 night deal .Servo and shop across the road, Cheapest petrol in town . Show a club card or one of my coasters to get a 10% discount. Come sit back and just relax in our quiet park get your rod out and maybe you might have fish for dinner. DON'T forget we are PET FRIENDLY. OH FREE EGGS TOO. So come soon to Finley and say HI. SEE YOU ALL SOON – ELNA ? ? ? Please write your message to Finley Lakeside Caravan Park in the message box. We will make sure that they get your message ASAP.